Married for 20 years to the Reverend Benjamin Lynch, a handsome, ambitious minister of the prestigious Methodist church, Dean Lynch has never quite adjusted her temperament to the demands of the role of a Sunday wife. When her husband is assigned to a larger and more demanding community in the Florida panhandle, Dean becomes fast friends with Augusta Holderfield, a woman whose good looks and extravagant habits immediately entrance her. As their friendship evolves, Augusta challenges Dean to break free from her traditional role as the preacher's wife. Just as Dean is questioning everything she has always valued, a tragedy occurs, providing the catalyst for change in ways she never could have imagined. 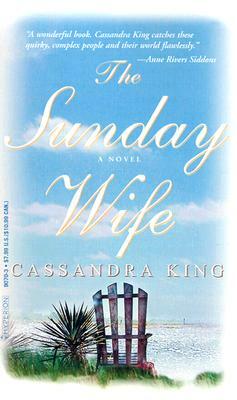 Cassandra King is the author of The Sunday Wife, The Same Sweet Girls, Making Waves and Queen of Broken Hearts. A native of Lower Alabama, she lives in the Low Country of South Carolina with her husband, novelist Pat Conroy.